Our concept is based on the perception of clothing as a module. This clothing has both input and output. Say, we have an inner wear that senses the body temperature and changes its color. In this case, body temperature is input through a temperature sensor and processed by microcon-trollers. that inputs the light output from the inner wear, “the coordination of information” can be established. Effectors, for example accessories, hats and bags, can be also thought that amplifies the output of a module. This conceptual model is similar to the analog synthesizer. In analog synthesizer, users can generate infinite original sound by connecting and tuning three modules, VCA, VCO and VCF. We have named our model “Wearable Synthesis” in the meaning of enabling original fashion expression by combining individual fashion items. - ACM SIGGRAPH Cyberfashion Show 2005. - IEEE ISWC Fashion Show 2005. - 脇田玲, 丹治基浩, 渋谷みどり, 北田荘平, 内山博子, 稲蔭正彦、ファッションにおけるウェアラビリティを考慮した衣服構造、情報処理学会ヒューマンインターフェイス第115回研究会、2005. 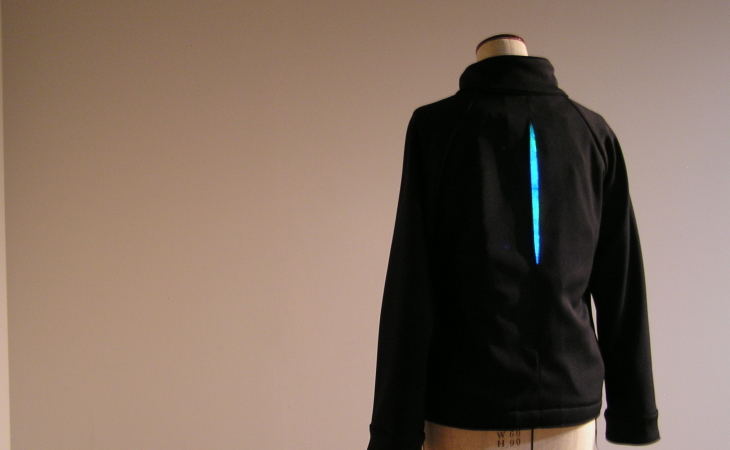 - 脇田玲, 丹治基浩, 北田荘平, 渋谷みどり, 内山博子, 稲蔭正彦、Wearable Synthesis : ウェアラブルファッションにおけるコーディネーションフレームワーク、情報処理学会ヒューマンインターフェイス第114回研究会、2005. - 予感研究所 - アート＋テクノロジー＋エンターテイメント 325人の研究者たちの予感, 2006年5月3日-7日. - Akira Wakita et.al., Wearable Synthesis : A Coordination Framework for Wearable Fashion, IPSJ SIG Technical Reports, 2005(71(2005-HI-114)), 57-62, 2005-07-22. - YOKAN-KENKYUJO, Miraikan, May 3-7, 2006.